E-waste is among the fastest growing waste streams across the world today, with its growth fuelled by exponential growth in the use of electronic equipment, especially PCs (personal computers), and their rapid rate of obsolescence. The disposal of e-waste is a major problem because of the presence of toxic elements such as lead, mercury, and cadmium. The backyard recycling operations are mostly rudimentary in nature, causing extensive damage to both the environment and human health. Therefore, there is an urgent need to adopt an environment-friendly and simple technology for recycling these wastes. There is also a need to create awareness among stakeholders, including workers involved in e-waste recycling units. 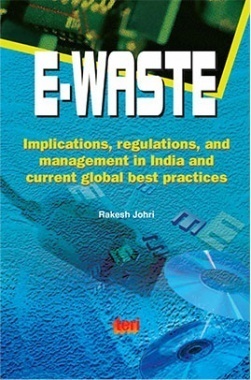 The book addresses these issues and also covers international best practices and regulations on e-waste.